NASA's Aqua satellite captured clear view of the eye of Hurricane Jose at it moved toward the Leeward Islands and strengthened into a Category 4 Hurricane on the Saffir-Simpson Hurricane Wind Scale. Aqua also analyzed the storm in infrared light showing powerful storms around the center, capable of heavy rainfall. On Sept. 8, the National Hurricane Center posted a Hurricane Watch for Antigua, Barbuda, and Anguilla, Saint Maarten, St. Martin and St. Barthelemy. A Tropical Storm Warning is in effect for Antigua, Barbuda, and Anguilla, and a Tropical Storm Watch is in effect for Montserrat, St Kitts, and Nevis, Saba and St. Eustatius. The Atmospheric Infrared Sounder or AIRS instrument aboard NASA's Aqua satellite captured infrared temperature data on Hurricane Jose on Sept. 8 at 12:53 a.m. EDT (0453 UTC). The image showed some very cold cloud top temperatures as cold as minus 63 degrees Fahrenheit (minus 53 degrees Celsius) around the center of circulation and in a feeder band of thunderstorms west of the center. NASA research has shown that cloud tops that cold are high in the troposphere and have the potential to generate heavy rainfall. 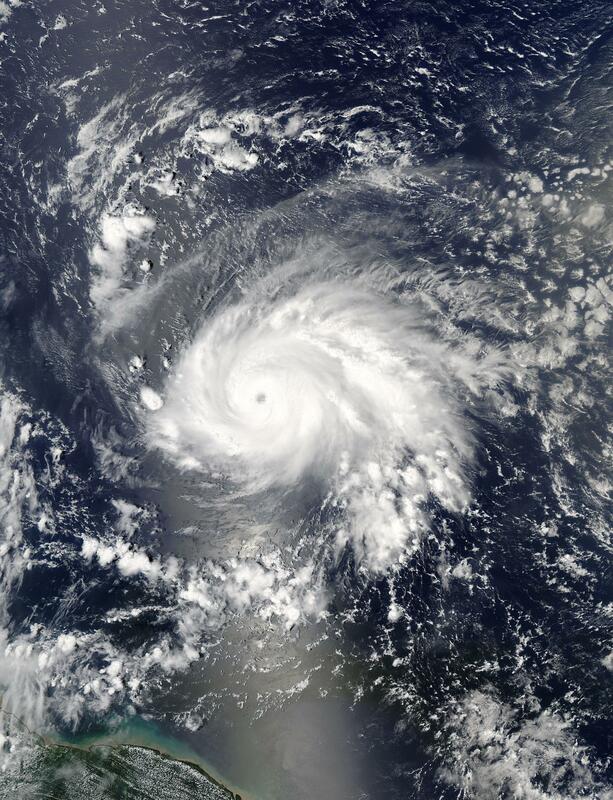 On Sept. 8 at 12:45 p.m. EDT (1645 UTC) the Moderate Resolution Imaging Spectroradiometer or MODIS instrument aboard NASA's Aqua satellite captured a visible-light image of Hurricane Jose. The image showed a symmetrical storm with powerful bands of thunderstorms around a clear eye. The National Hurricane Center (NHC) said at 10 a.m. (1400 UTC), the eye of Hurricane Jose was located near 16.2 degrees north latitude and 56.9 degrees west longitude, about 435 miles (700 km) east-southeast of the Northern Leeward Islands. Jose was moving toward the west-northwest near 18 mph (30 kph). A slower west-northwestward motion is expected during the next couple of days. Maximum sustained winds are near 150 mph (240 kph) with higher gusts. Jose is a category 4 hurricane on the Saffir-Simpson Hurricane Wind Scale. The estimated minimum central pressure is 942 millibars. On the forecast track, Jose is expected to be near the northern Leeward Islands on Saturday, Sept. 9.